Students in SBCS used a customised class forum to discuss aspects of their course they needed assistance with prior to exams. Students at the School of Biological and Chemical Sciences (SBCS) Staff and Student Liaison Committee expressed an interest in lecturers setting-up discussion forums to assist with revision (rather than them setting-up Facebook sites for this purpose) and it was agreed that a trial would take place on around twelve modules in the run-up to the exams. 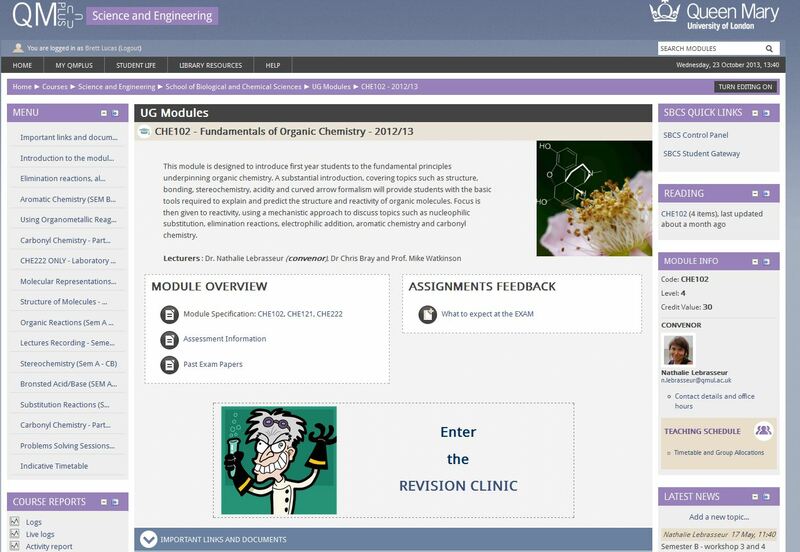 They set up the forums under the title “Revision Clinic” on various first-year chemistry module pages using an eye-catching cartoon image of a scientist with a bubbling test tube to make it unmissable. As this was the first use of forums with these students, and at a time when they would not be on site to ask for help, care was taken to post very clear instructions for how they should be used. The new forums were launched immediately after Easter and students were asked to direct all enquiries to the forum, i.e. not emailing staff directly, but still indicating they could make appointments to see members of staff in person if they wished to do so. The school allowed students the ability to include images, links and pdfs as attachments to forum posts and used Forced Subscription mode, so all staff and students who were enrolled on the module would receive an email update whenever someone posted to the forum. This mode was selected so that the email traffic would engage students who might not otherwise have started their revision and it was felt that the forum would be inclusive in that it doesn’t matter if students are in London or elsewhere. Members of staff also encouraged students to respond to other students’ queries if they felt they could answer them. Should be allowed to unsubscribe from forums to opt-out of receiving emails? What are the best ways of dealing with students giving incorrect information when answering other students queries. Although this could be worrying in case those reading it believed the incorrect information, it could also be seen as way of identifying areas that students had misunderstood and tactful correction from a member of staff actually ensures that all those subscribed to the forum had been given the right information rather than only the student asking the question.